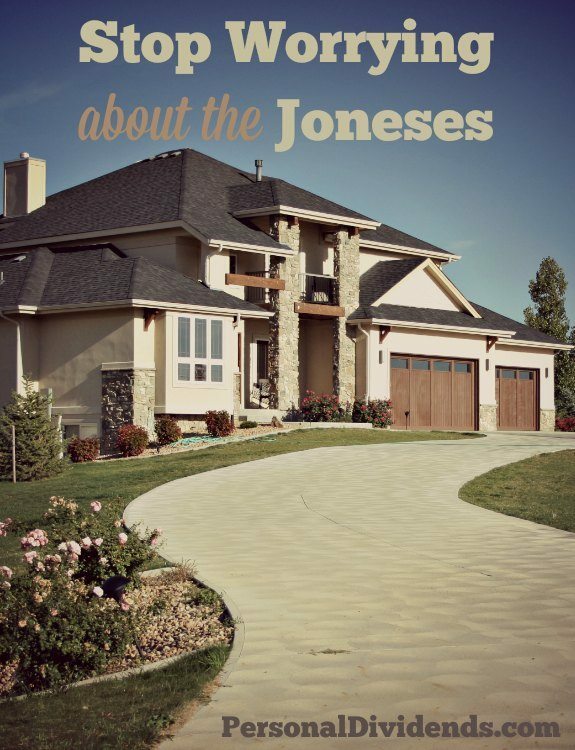 We hear all the time that we need to stop trying to keep up with the Joneses. And it’s true. Chances are that you are keeping up with the Joneses debt, rather than keeping up with them in any other way. You can also experience a great deal of peace of mind once you stop worrying about the Joneses, since you will no longer be going into debt to keep up with a certain lifestyle. But how do you stop worrying about the Joneses? It’s not always easy to stop comparing ourselves to others and feeling as though we are missing out because our lives don’t look like their lives. It takes planning and effort to get to the point where you don’t worry about the Joneses anymore. Here are some ideas to help you stop thinking about what everyone else has, and focus more on what matters to you. The first step to your freedom from the Joneses is to figure out what matters to you. What are your own values and priorities? Sit down with your significant other, or find a quiet place by yourself, and figure out what really matters to you. Look inward. What makes you happy? What helps you feel secure in your finances and your situation? What experiences or things do you enjoy most? Don’t think about what you “should” be doing, or what you think is the “right” answer. Be honest about what truly matters in your life. Once you understand yourself, and what makes you tick, it’s easier to figure out how to craft the lifestyle you want — without reference to what’s “normal.” Use your new knowledge of yourself to set priorities for your spending. One of the problems that many of us have is that we don’t have spending priorities, and we don’t have plans for our money. It’s easy to be swayed into purchasing whatever catches your eye at the moment if you don’t have overriding priorities and plans. If you can establish your values and priorities, it’s much easier to evaluate your spending and ask yourself if what you’re doing is furthering you toward your goals. The messages surrounding us contribute to our decisions. From commercials on TV to the fabulous images we see on Facebook, there’s a great deal of noise encouraging you to covet what others have. Additionally, media pushes us to measure ourselves against others. Whether you measure yourself against an idea of “stylish” and “wealthy” presented by a commercial, or whether you measure yourself by the picture of the new SUV your sister just shared on Instagram, you are fighting a losing battle. Once you start paying attention to the noise and comparing yourself to others, you lose sight of your own values and priorities, and start spending according to someone else’s values and priorities. Don’t let that happen. Turn off the TV. Take a break from Facebook. Tune out some of the noise, and focus on the things that truly matter in your life. Finally, it’s easier to stop worrying about the Joneses when you surround yourself with people who share your money values. If you are more interested in the outdoors than going to the movies every weekend, stop hanging around with people who just want to go to the movies. If you don’t care about buying new cars every three years, don’t surround yourself with people who continually buy new cars. If you want to be frugal, hang out with frugal people. Look for a support system that can encourage you in your goals so that it’s easier to focus on your own values and priorities. This is kind of a cheat, because in some ways you are worrying about the Joneses a little bit. However, in this scenario, you’ve changed who the Joneses are. You don’t need to go through life mindlessly spending money to try and impress the Joneses of the world with a lifestyle you don’t even care about. Instead, figure out what you really want out of life, and make a plan to attain it. Once you are ready to create a lifestyle you truly enjoy, you won’t feel like you’re missing out, just because you’re not like the Joneses. In the past years we were able to really ignore the ‘noise’ and focus on our own family. It’s true, we are surrounded by people who have more or less than us, but we’re focusing now on what’s more important and chose the things we want to ‘invest’ in and those we don’t really care about. We love to travel for instance, so we’re ‘sacrificing’ dining out or buying too many clothes for instance. I love how you have “sacrificing” in quotes. If it’s not really important to you, it’s not truly a sacrifice 🙂 And the other things you can do more than make up for it!